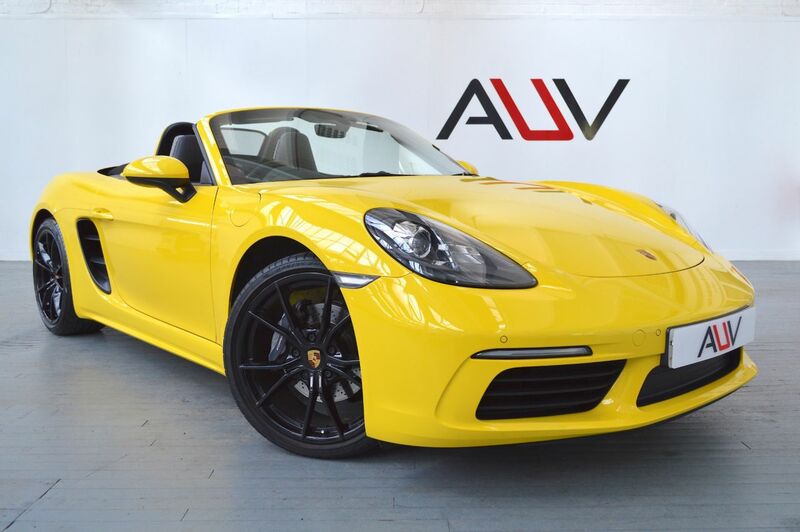 We are pleased to offer on sale this stunning 718 Porsche Boxster 2.0L PDK finished in Racing Yellow. One owner from new with the following specification. Dual clutch PDK transmission, Sports Chrono Plus package, Black stopwatch and instrument dials, High gloss black 20 inch Carrera S alloy wheels, Lane change assist, Black sport tailpipe covers, Park distance control front and rear, Black leather GT Sports steering wheel, Mechanically adjustable steering column, Black leather & Alcantara heated Sports seats, Navigation System High, Traffic sign recognition, Pedestrian protection, Climate controlled Air conditioning, Gen 2 Premium Radio, AUX-In and USB/I-Pod electric interface, Mobile telephone preparation, Voice control, Electrically retractable door mirrors, Anti-dazzle interior mirror, Xenon Lighting system, Dynamic engine mounts (PADM), VTS Security (with PCC) Anti-theft lock wheel bolts with concave wheel centres and colour Porsche crest, Tire pressure monitoring (TPM) Engine stop/start function. Before you reserve a vehicle we ask that you read both our Business and Warranty conditions in the 'Terms' tab above. Specialists in vehicle financing we can offer our clients market leading, bespoke funding packages. Finance examples are subject to status, regulated and monitored by the FCA. Goods and services are supplied by Approved Used Vehicles Ltd. For further information on how to reserve this vehicle or tailor your finance package please call us on 01455 446505.